Today we have LoJack to catch laptop thieves, but back in 1961 stopping a robber from running off with your briefcase was a tad more challenging. 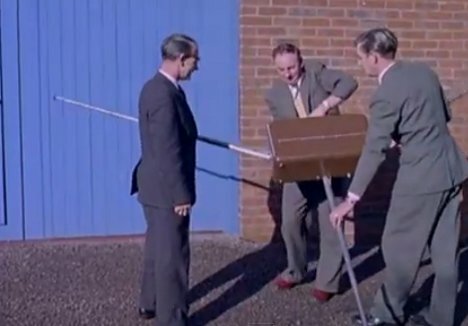 In this classic “Beat the Bandit” clip from British Pathe, three men demonstrate an anti-theft briefcase called the Arrestor. Thieves trying to run off with this case would get a few very nasty surprises. The clip does not mention how the system is activated, but once it is it makes life very difficult for the burglar. A loud siren begins to wail, the handle clamps down on the thief’s fingers, and three twelve-foot-long metal poles shoot out which make it impossible to enter a vehicle or go through a doorway. The only way to shut off the alarms, release the thief’s hand and retract the poles is to open the case with its key. Of course, modern thieves would probably sue for wrongful imprisonment, but we still think this is a top-notch idea for deterring thefts. See more in Vintage Videos or under Vintage & Retro. February, 2012.